Propelled by the creative genius of Tex Avery, Chuck Jones, and Friz Freleng, Warner Brothers' "Looney Tunes" introduced the world to some of the greatest cartoon characters to ever grace the animated cel: Bugs Bunny, Daffy Duck, Porky Pig, Elmer Fudd, Yosemite Sam, Foghorn Leghorn, Speedy Gonzalez, Pepe LePew, Wile E.Coyote, Road Runner, Tweety, Sylvester, Marvin the Martian, Tasmanian Devil, and many more. This second volume honors Warner Brothers' golden age of animation with 30 more cartoon shorts remastered and restored to their original, uncut versions. • “Reach For Your Brushes, Ya Varmints!" 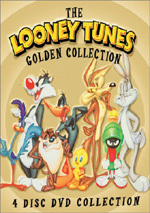 After the successful Looney Tunes packages from 2003, Warner Bros. digs into their archives once more for new releases. With the Looney Tunes Spotlight Collection 2, we get a continuation of the series begun with Premiere Collection. This one’s title seems odd; it’s not really the second “Spotlight Collection” since the first was the “Premiere Collection”. 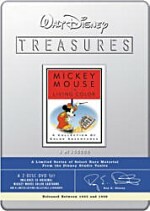 No matter – both work the same way, and Spotlight presents two discs of animation with a total of 30 cartoons. These shorts span a range of 21 years. The earliest – “I Love to Singa” – comes from 1936, while the newest – “What’s Opera, Doc” and “Show Biz Bugs” – emanate from 1957. Bad Ol’ Putty Tat (1948, I. Freleng): Sylvester attempts a number of methods to lure Tweety from his birdhouse into the cat’s mouth. 8/10. All Abir-r-r-d (1949, I. Freleng): Tweety’s owner ships him on a train. He ends up alongside Sylvester, who’s also in transit. Sylvester attempts to eat Tweety despite the admonitions of the conductor. 6/10. Room and Bird (1950, I. Freleng): Their respective owners sneak Sylvester and Tweety into an apartment complex that doesn’t allow pets. Sylvester then tries to eat Tweety all while they avoid the attention of the building’s rule-enforcing detective. 6/10. Tweet Tweet Tweety (1950, I. Freleng): During his family’s stay at a national park. Sylvester attempts to sneak into the bird refuge. He finds an egg, on which he nests until it hatches. Tweety soon emerges, and Sylvester attempts to eat him. 5/10. Gift Wrapped (1951, I. Freleng): Disappointed with his Christmas presents, Sylvester discovers that someone gave his owner Granny a Tweety Bird. Sylvester strives to eat the critter despite Granny’s warnings. 5/10. Ain’t She Tweet (1951, I. Freleng): Sylvester sees Tweety in a pet shop window. He tries to steal the bird so he can eat him. This intensifies when Granny buys Tweety and brings him to her home along with many dogs. 4/10. A Bird In a Guilty Cage (1951, I. Freleng): Sylvester sees Tweety on sale in a department store. He sneaks into the business and attempts to eat him. 6/10. Snow Business (1951, I. Freleng): A terrible snowstorm traps best friends Sylvester and Tweety in a secluded cabin. With nothing to eat other than bird seed, Sylvester tries to consume his little birdie pal. Matters complicate when a starved mouse strives to chow down on the cat. 6/10. Tweetie Pie (1946, I. Freleng): Thomas - the cat later known as Sylvester - finds Tweetie in the snow and tries to eat him. The feline’s owner catches him and makes the bird her pet. Despite her warnings, Thomas still tries to chomp on Tweetie. 6/10. Kitty Kornered (1946, R. Clampett): Porky Pig tries to put his four cats out for the night. They prefer to avoid the cold and a struggle ensues. 8/10. Baby Bottleneck (1945, R. Clampett): A baby boom taxes the stork. As such, unconventional help comes to the rescue, and Porky and Daffy Duck head up the efforts to streamline the operation. 7/10. Old Glory (1939, C. Jones): Schoolboy Porky finds it tough to memorize the Pledge of Allegiance and throws away his textbook. When he snoozes, history comes to life to teach him the importance of the Pledge. 4/10. The Great Piggybank Robbery (1946, R. Clampett): Comic book fan Daffy accidentally knocks himself unconscious. He dreams of himself as Duck Twacy and investigates a piggybank crime wave. 7/10. Duck Soup to Nuts (1944, I. Freleng): Porky hunts ducks. Daffy outwits him. 7/10. Porky In Wackyland: (1938, R. Clampett): Porky Pig travels the world to hunt the do-do bird. His quest takes him to the African nation of Wackyland, a terribly surreal place. 6/10. Back Alley Oproar (1947, I. Freleng): Sylvester sings his own street serenade. Elmer Fudd wants to sleep, so he attempts to quiet the cat. 7/10. Book Revue (1945, R. Clampett): At the stroke of midnight, books in a store come to life. Daffy springs from the cover of a comic book and joins the festivities. 6/10. A Corny Concerto (1943, R. Clampett): In the first segment, Porky hunts Bugs to the strains of a Strauss waltz. “Blue Danube” follows with the attempts of a vulture to eat some ducklings. 8/10. Have You Got Any Castles? (1938, F. Tashlin): Ala “Book Revue”, characters from novels escape their text confines and party. 5/10. Hollywood Steps Out (1941, T. Avery): Movie stars visit Ciro’s Nightclub for dinner and a show. We see many caricatures of the day’s famous talent. 6/10. I Love to Singa (1936, F. Avery): Classical music aficionado Professor Fritz Owl’s wife gives birth to jazz-adoring owlet. The Professor attempts to force his beliefs on his offspring. 4/10. Katnip Kollege (1938, C. Dalton and C. Howard): Jazz is the order of the day at this institution of higher education. The feline students study “swingology”, a subject that eludes nerdy Johnny. He needs to get his groove on to pass the class and get back his girlfriend Claudia. 3/10. The Hep Cat (1942, R. Clampett): Rosebud the dog tries to put a cocky “hep cat” in his place. This leads the pooch to try to trap the kitty. 7/10. The Three Little Bops (1956, I. Freleng): The Three Little Pigs play a club called the House of Straw. This leads to an updating of their tale in a jazzy setting. 8/10. One Froggy Evening (1955, C. Jones): The destruction of an old building reveals a singing and dancing frog inside its cornerstone. The worker who finds him tries to parade the croaker for monetary gain, but the frog only performs for the man, which causes frustrations. 8/10. Rhapsody Rabbit (1946, I. Freleng): Bugs performs a piano concert. The Bunny encounters problems when a pesky mouse makes himself part of the act. 8/10. Show Biz Bugs (1957, I. Freleng): Bugs and Daffy play a musical show together. The Duck becomes irritated because the Bunny receives top billing and all the adulation. 8/10. Stage Door Cartoon (1944, I. Freleng): Elmer hunts Bugs. As the Bunny flees the predator, he ends up in a musical theater, where their chase becomes part of the show. 7/10. What’s Opera, Doc? (1957, C. Jones): To the strains of Wagner, Elmer attempts to “kill the wabbit”. An operatic battle ensues. 8/10. You Ought to Be in Pictures (1940, I. Freleng): At the Warner animation studios, Daffy and Porky leap off their drawing pads when the artists go to lunch. The Duck challenges the Pig to quit and get a gig as Bette Davis’s co-star. This leads to a meeting with producer Leon Schlesinger and Porky’s departure from the studio, which excites Daffy since he plans to become the big star. 8/10. When we look at my unscientific assessments of the various shorts, DVD Two ends up as the winner by a slight margin. Those cartoons averaged a number grade of 6.2, which was a smidgen higher than DVD One’s 6.07. Of course, your mileage may vary, as my scores demonstrated my own biases. DVD One features a lot of Tweety, who never became one of my favorite characters. DVD Two includes a broader base of talent, so while it presents the worst short of the package’s 30 with the feeble “Katnip Kollege”, it’s a little stronger overall. The biggest problem with the Looney Tunes Spotlight Collection 2 comes from the fact it’s too short! Fans will rectify that problem if they go after the Golden Collection 2 instead; it doubles this set’s 30 shorts. (All 30 of these also appear on the Golden Collection.) For those who just want a small sampler, however, the Spotlight Collection might fill the bill. 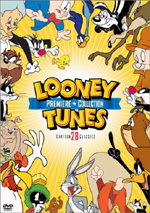 Looney Tunes Spotlight Collection 2 appears in an aspect ratio of 1.33:1 on these single-sided, double-layered DVDs; due to those dimensions, the image has not been enhanced for 16X9 televisions. If you expect visuals that differ from those of the 2003 Looney Tunes sets, you’ll not find any. For better or for worse, these shorts looked a lot like those. Source defects seemed more problematic. The level of defects varied wildly from short to short. Some looked quite clean, while others demonstrated various issues like grain, hairs, specks, marks, and dust. I suspect that a lot of these issues came from the original photography and not from the transfers themselves, but the material still could have used a good cleaning to get rid of some of these distractions. The monaural audio of the Looney Tunes also matched closely with what I heard from the 2003 DVDs. That created continued definite disappointments. As with the visuals, the quality of the sound varied from short to short, and some of them sounded pretty good given the restrictions connected to recording technology of the era. At their best, the cartoons were reasonably distinctive and natural and showed moderately positive dynamics. Unlike the supplement-packed Golden Collection, this Spotlight Collection comes with only a few extras. On DVD One, we get two pieces: Cat Got Your Brush? and Reach For Your Brushes, Ya Varmints!. The first runs 108 seconds, while the second fills 84 seconds. One might expect tutorials in how to draw characters, but instead each one simply shows an artist as he sketches Tweety and Sylvester (“Cat”) and Bugs and Yosemite Sam (“Reach”). DVD Two gives us Framing Up Michigan J. Frog and The Trace Race. These work the same as disc one’s two pieces. “Frog” shows the drawing of that character (95 seconds), while “Trace” depicts the sketching of the Road Runner and Wile E. Coyote (84 seconds). All four are a waste of time. 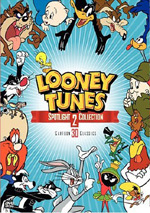 For fans of classic animated shorts, the Looney Tunes Spotlight Collection 2 provides a decent sampler of the material. We find a lot of pretty good shorts across the set. The picture quality varies but usually seems quite good. Unfortunately, audio seems fairly weak, and the set comes with poor extras. While I don’t find any serious problems with the Spotlight Collection, I can’t think of many reasons to recommend it instead of the more extensive Golden Collection 2. The latter includes twice as many cartoons and also includes a very good roster of supplements, none of which show up here. With one full platter devoted to Bugs Bunny, the Golden Collection 2 also includes much higher quality shorts. Go with the Spotlight Collection only if you’re not a big fan of the Looney Tunes and don’t want to shell out the extra bucks for the Golden Collection 2; while this package retails for about $27, the latter goes for a much higher $64.92. Personally, I think the Golden Collection 2 is worth the additional money, but fans on a tight budget should get a kick out of the Spotlight Collection.